Most game creator software has either a very simple editor or a very advanced editor which is what sets Sharendipity apart. They have a simple editor where you can take a set number of templates and customize them quickly to release a new game. On top of that however they also have an advanced editor where you can dig deep into the game and create code components from dragging and dropping various actions together and then combining multiple components together into a simple game to make a complex game. For example they even have a build your own tower defense style game built with their game engine. This is the simple editor for Sharendipity. It is also interesting that they combine a lot of different technologies to get the job done (usually people use all Flash or all Java or all some download application). Sharendipity has the simple game creator built in Java and then the games publish out as Flash games (smart). 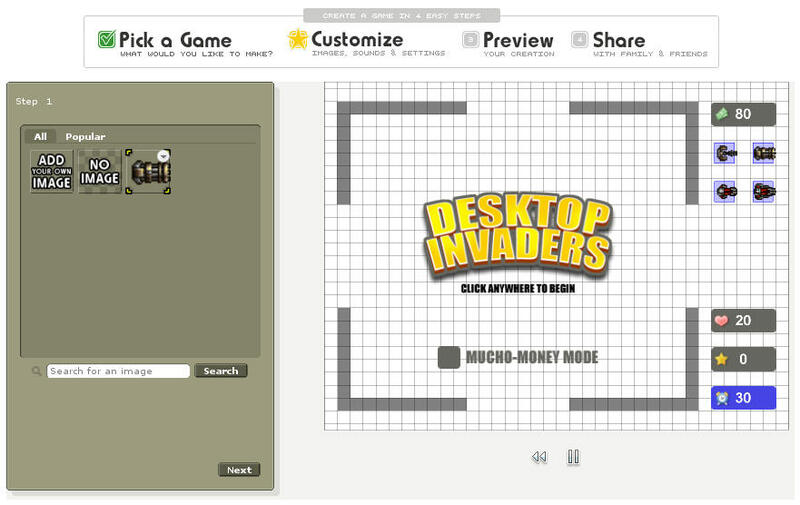 In their simple game creator you choose a template of a game you would like to customize like a tower defense game or a filler game and then you can customize the images in the game (flip them around, scale them, or upload your own). In this way it is a lot like the Pulado make your own games engine because you can upload your own custom content. I’m not sure if they allow uploading of SWF files however. 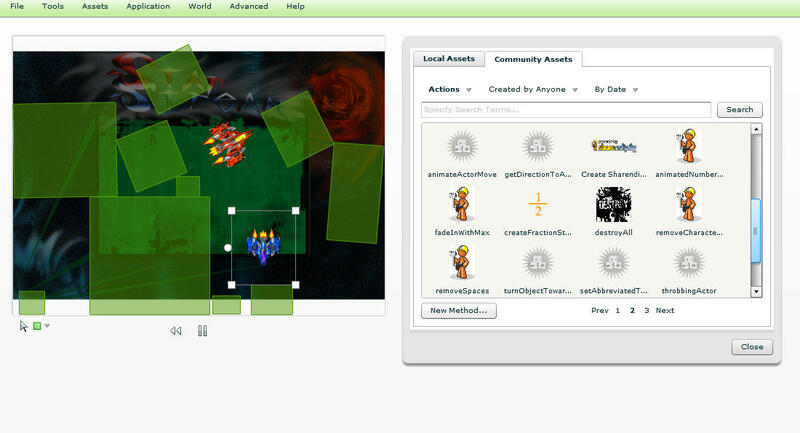 You can also customize the images and sounds in your game using the simple editor. It also feels like you can customize the game in real time. 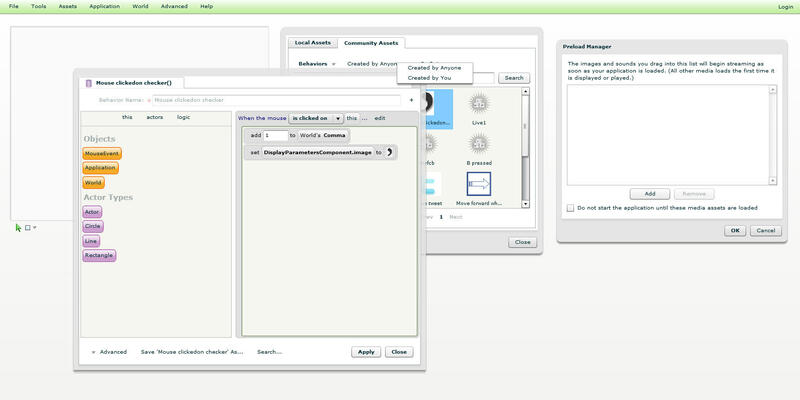 The above image is a screenshot from the Sharendipity advanced editor. It shows their code creator window, a preloader manager (where you can upload your own preloader for the game), and the asset navigator. I’m actually pretty impressed by their editor as they let you build and play the game in real time. Their engine also does physics and I was able to start drawing boxes which automatically had physics attached to them and they interacted in the play area. Once I had boxes on the screen I as then able to drag image assets and assign them to the boxes. Finally I was able to attach custom behaviors to each of the boxes as well. It even comes with more advanced tools like a thread navigator, a breakpoint editor, and a performance profiler. The advanced game editor looks like it is built in Flex (Flash). The advanced editor is pretty advanced as for the most part you’re building a lot of them game yourself from scratch. Check out Sharendipity for yourself here and if you make a game with it make sure to send it to me! Scratch is a projected hosted at MIT that is an interactive story, game, music, and art create. Users download a client which is available for Windows, Mac, and Linux and then create their masterpiece. 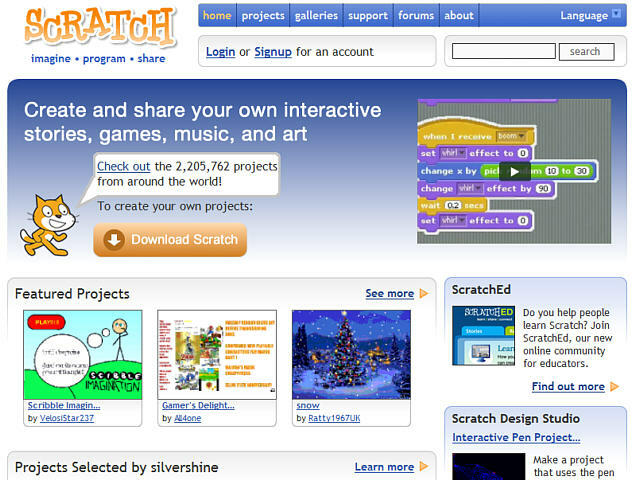 The interactive games are then published to the Scratch website where they can be played in the web browser. They are published in Java (verses Flash like our Make Your Own Games engine on Pulado). According to their website there are over 2,200,000 published interactive projects on their site from almost a million members. That is quite a few games created with a game creator software. Apparently lots of elementry schools use Scratch in the classroom to teach interactive story, game creation, and even programming. It has a simple code interface where you drag blocks of code together and change variables. Java produces some pretty unpolished graphics but with the right tools some nice looking games could probably be produced with Scratch. Scratch seems to be much more open then a lot of other game creators out there in that you can create or add all of your own custom graphics. In fact it looks like that is the main source of graphics for Scratch (things that you make yourself). Scratch has a huge community of users in multiple different languages from around the world. They also have all kinds of video tutorials linked on their website on how to use Scratch. There doesn’t seem to be any mention of mobile on their site as I think it is more geared towards being a learning tool than anything else. Check out Scratch for yourself on MIT’s website here.